I am interviewed by blogger/reviewer Liis Pallas. Hi, beloved Brain-Babies readers! I’m back with a new author interview! And again- you’ll love this one! 🙂 I am truly lucky to be contacted by such interesting authors who write even more interesting books! 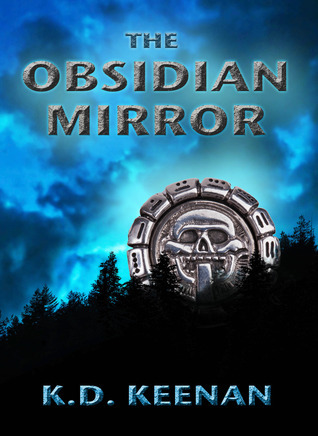 Don’t forget to check in soon, as I will be posting my review of “The Obsidian Mirror”!!! 1. How did the idea for “The Obsidian Mirror” form? So why do writers spend so much time on social media? Is there any indication that social media helps to draw in new readers or sell books? We all (publishers and writers alike) have this childlike faith that it does, but is there any proof? Then there’s the question of: Does it matter if social media works or not? Because what else do we have? If you’re Neil Gaiman or Ken Follett or Dan Brown, your publisher is worshipfully setting up public appearances and paying for full-page ads in The New Yorker. If you’re like the rest of us, you are doing most—if not all—of your own marketing and publicity. Then there’s the amount of time we spend just reading posts and following links and signing petitions. Signing petitions. I suddenly realized that 75%+ of my email was from organizations whose aims I support, either asking me to sign petitions or asking for money, or both. I like signing petitions because it seems to me that they are a way for ordinary people to make their voices heard. It’s also a way to provide a voice to those who have none—endangered species, abused farm animals, and homeless people, for example. I was delighted that several of the petitions I have signed were successful. A corporation changed its open-carry policy. A former K-9 Corps soldier was allowed to adopt his dog and take it home from Afghanistan (which otherwise would have been dumped in that country as a way of saying thanks for its service). A corporation raised its minimum wage. All of these things encouraged me to continue signing. I felt like I was doing something—a tiny something, but something—to support good causes and hopefully make the world a better place. But the universe of good causes had discovered their ultimate sucker. I was getting messages from political candidates running in states in which I do not live, asking for my money. I got petitions from individuals asking for help for their relatives. I received just too many emails and petitions from too many organizations. It was taking half my limited time just to sort through them and sign the ones I was interested in supporting. Add to this situation that our household recently expanded due to the addition of Jessamyn, now almost five months old. Jessamyn is a chubby pink charmer who graces all around her with wide, gummy smiles and delighted cooing. She adores my singing (I think she’s the only one). She is also demanding and needs a lot of attention, just like any other baby. Her mother went back to work outside the home, and a lot of baby and childcare devolved upon my husband and me. So I had to choose between Jessamyn and the petitions. You may not be surprised to hear that Jessamyn won. I unsubscribed from every one of them. I mark them as “junk” when they enter my mailbox—even though I feel a twinge of guilt every time. It still takes too long to get through my email. The email system still hasn’t really learned which things are junk. For some reason, the system leaves a lot of unwanted email in my “In” box, even though it carefully marks them with a yellow notice that says, “Postbox thinks this is junk mail.” Well, if you think it’s junk mail, what the hell is it doing in my inbox? But it’s getting better. Getting though my email is gradually becoming a shorter process. I have a little more time each day to devote to book marketing and research on the sequel to “The Obsidian Mirror.” It’s not enough, but as the days grow shorter, my working day is a tiny bit longer. But I still feel guilty about not signing all those petitions.